Urinary incontinence has remained one of the most bothersome problems after the operative procedure for the treatment of prostate cancer. We compared the results of laparoscopic radical prostatectomy (LRP) with robot assisted radical prostatectomy (RARP) against the perspective of the five surgical steps among the various techniques to improve postoperative urinary incontinence. We have routinely performed five surgical steps for preventing postoperative incontinence both in LRP (n=20) and RARP (n=20) group. The first step was the delicate dissection without thermal injury between the endopelvic and prostatic fascia which preserved the levator and periurethral muscle of the levator system. The second step was the bladder neck preservation through careful dissection of the prostatovesical junction. The third step was the posterior reconstruction to reapproximate the flap to the distal end of Denonvilliers’ fascia close to the urethral stump. The fourth step preserved the puboprostatic ligament complex which was refixed to the anterior aspect of the vesicourethral anastomosis. The fifth step anchored the bladder neck to the pubic bone. The perioperative parameters of both groups didn’t show the statistical difference (Table 1). The pad free ratio in RARP group (30%) at postoperative 2 weeks was twice as high as that in LRP group (15%). 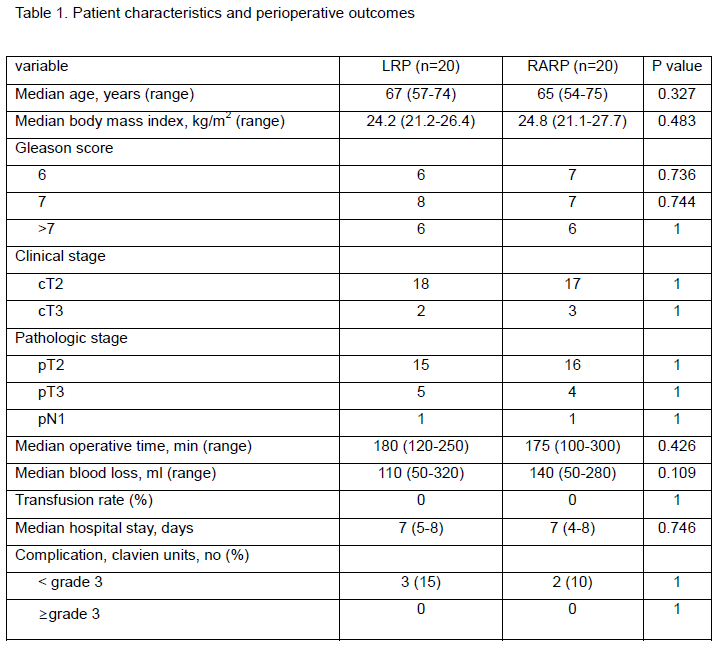 However, pad free ratio of LRP group compared with RARP group at 1, 3, 6 and 12 months postoperatively was not significantly different (Table 2, p>0.05). In our study, the five surgical steps to prevent postoperative incontinence were easily and safely performed both in LRP and RARP. The five steps provided excellent results for the recovery of the postoperative continence irrespective of surgical approach.